NEW !! Brewer’s Best American Classic One Gallon Ingredient Kit. This recipe uses the t..
NEW !! Brewer’s Best American Red One Gallon Ingredient Kit. A medium-light bodied ale ..
NEW !! Brewer’s Best American Wheat One Gallon Ingredient Kit. Wheat malt and select hops cr..
NEW !! Brewer’s Best IPA One Gallon Ingredient Kit. We use plenty of hops to accent this pop..
NEW !! Brewer’s Best Pale Ale One Gallon Ingredient Kit. Pale Ale is Perhaps the most widely..
NEW !! 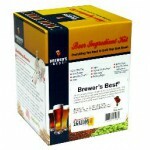 Brewer’s Best Porter One Gallon Ingredient Kit. A classic dark ale featuring chocolat..